American Crow or Common Raven? The American crow and the common raven are two nearly identical birds, but these large black birds can be easily distinguished from one another if you know what characteristics to compare. Though they are often misidentified, you can learn to confidently tell these two corvids apart through careful observation not only by field marks but also by behavior. Size: One of the easiest differences to see between these two birds is the overall size. American crows are smaller at roughly 19 inches, just larger than a rock pigeon. Common ravens are much larger, roughly 25 inches long, or nearly the size of a red-tailed hawk. Learning how to judge a bird's size can help you use this field mark as a reliable clue effectively. Bill: Both of these birds have large bills, but the American crow's bill is slightly thinner and more delicate, with a straighter shape. Common ravens have much heavier bills and the top of the bill noticeably curves down close to the tip. On both birds, short feathers cover the base of the bill, but ravens have much more extensive feathering that extends nearly halfway or even further down the length of the bill. Throat: The crow has a smooth throat with relatively short feathers, while the raven has a thicker throat with long, shaggy feathers. This is especially noticeable when the birds are calling and the feathers will stick out more prominently. Wing Shape: Crows have straight wings that have very little bending along either the leading or trailing edge. Ravens' wings are longer with a more visible crook at the wrist and the primary feathers are more splayed, showing more "finger" space between them. Tail Shape: When these birds are soaring, the tail shape can be a strong clue for proper identification in the crow vs. raven debate. American crows have shorter tails with only a very slight curve showing when the tail is fanned in flight. Common ravens have longer tails, and the feathers in the center of the tail are significantly longer, creating a distinctly pointed wedge, diamond, or V shape. Voice: The typical "caw-caw" call of the American crow is a familiar sound with evenly pitched syllables. Common ravens have a much coarser, rattling call that sounds like a long, slow croaking "grooonk" tone. While both birds have varied vocabularies, listening for these typical calls can help you identify the birds by ear. Flight: In flight, American crows are more energetic with frequent flaps. Common ravens, on the other hand, are more likely to soar and glide with only shallow, infrequent flaps. Ravens may even occasionally somersault in flight, which crows do not do. If the birds are flying nearby, a raven's wings may make a distinct swishing sound, while crows' wings are typically silent. Flocks: American crows are gregarious birds that will travel in family flocks and use communal roosts, creating large groups of raucous birds. Common ravens are much more solitary or are found frequently in pairs, but very rarely in larger groups. Range: American crows have a wide range across southern Canada and the continental United States, and northern populations will migrate in the winter. They also visit more varied habitats and can be found in urban and suburban areas. Common ravens are much more common in rural or agricultural areas of western North America and throughout Canada, including much further north than the crow's range. Ravens, however, are absent from the southeast and much of the central Great Plains. Ravens are also found in Mexico, Europe, and Asia, but the American crow is restricted to North America and is not found as far south as Mexico. Furthermore, common ravens do not typically migrate. When you see a large, black corvid in the field, it can initially be difficult to determine if it is an American crow or a common raven. Casual observation may not be enough to puzzle out which bird it is, particularly if you are in an area where their ranges overlap, but a closer look can reveal significant differences. First, watch the bird's behavior, and choose the appropriate clues to focus on. For example, if the bird is flying, study the tail shape, wings, and flight pattern. If the bird is perched, listen for calls and note more body shape characteristics. Telling the birds apart if they are seen together is a simple matter, as the size difference between the species will be obvious. 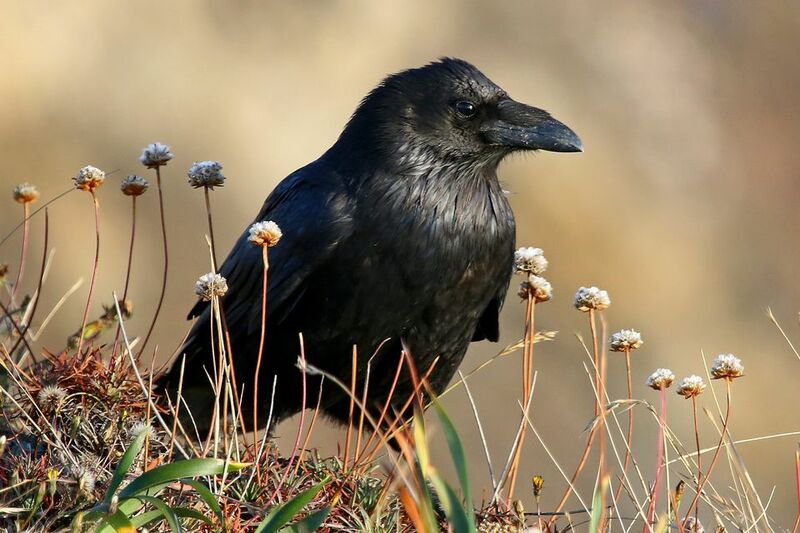 It is not always possible to determine whether one of these birds is an American crow or a common raven, but using different opportunities to try can be a great chance to sharpen your bird identification skills. The more you observe these two types of birds, the more you will notice the subtle differences between them, and the easier it will become to tell them apart. Bugs or Birds? Tell Hummingbirds and Hummingbird Moths Apart!